Welcome to Round 1 of YCS Pasadena! We’re starting off with Luis Castro, from El Monte, playing a combination HERO Prank-Kids Deck! 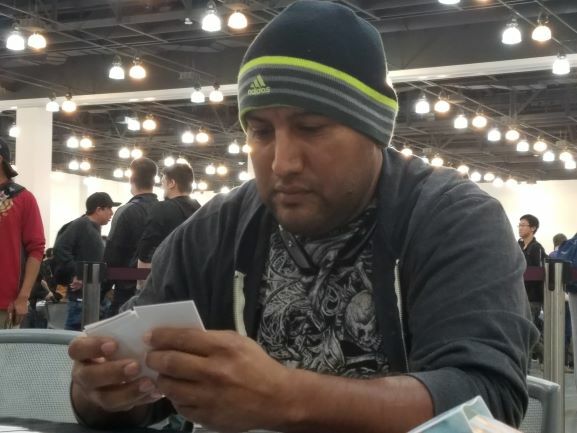 He said he was playing a HERO Deck in memory of Stan Lee – a true believer through and through. He’s up against Jaime Sandoval, from Long Beach. Sandoval’s using True Draco, a strategy that traditionally plays a lot of powerful floodgate cards like Gozen Match, which could give him an edge in this matchup. Castro won the dice roll and chose to play second. Sandoval began with Inspector Boarder and Dragonic Diagram. He Set Disciples of the True Dracophoenix, and destroyed it with Diagram to add True Draco Heritage to his hand. He activated Heritage and drew one card with its effect. Pot of Desires gave him two more cards, and he Set one in his back row. He Tributed Heritage for Ignis Heat, the True Dracowarrior to finish his turn. Castro had a hand of Destiny HERO – Malicious, D.D.R. – Different Dimension Reincarnation, Foolish Burial, Vision HERO Vyon, Polymerization, and The Phantom Knights of Shade Brigandine. He used Foolish to send a Malicious from his Deck to the Graveyard. He Set Shade Brigandine and activated it, then Normal Summoned Vyon. He Link Summoned Isolde, Two Tales of the Noble Knights, sending Divine Sword – Phoenix Blade, Moon Mirror Shield, Living Fossil, and Axe of Fools to the Graveyard, allowing him to Special Summon Elemental HERO Bubbleman. He activated Polymerization, fusing Bubbleman with Malicious from his hand to play Elemental HERO Absolute Zero! He banished Vyon and Malicious to bring Phoenix Blade to his hand. He then banished the other Malicious in his Graveyard to Special Summon his third copy of Malicious. Inspector Boarder was stopping him from using any other effects, so he sent Absolute Zero to destroy Boarder in battle. in Main Phase 2, Castro played D.D.R. – Different Dimension Reincarnation, discarding Phoenix Blade, to Special Summon Vision HERO Vyon. Vyon’s effect activated, and Sandoval Chained Ignis Heat to add True Draco Heritage to his hand. Vyon sent Elemental HERO Shadow Mist to the Graveyard, and Shadow Mist added Elemental HERO Blazeman to his hand. He used Malicious and Isolde to Link Summon Summon Sorceress, and it Special Summoned Elemental HERO Solid Soldier. Solid Soldier Special Summoned Blazeman, which then added Polymerization to his hand. He banished Malicious and Isolde to return Phoenix Blade to his hand once more. He used Blazeman and Isolde to play Topologic Gumblar Dragon, then used Vyon and Solid Soldier to play Knightmare Phoenix. Phoenix discarded the Phoenix Blade (how appropriate), to destroy Dragonic Diagram and draw Prank-Kids Lampsies, then Gumblar discarded Polymerization to force Sandoval to discard Inspector Boarder. Sandoval played another Dragonic Diagram, then Set a Terraforming. He had Diagram destroy it to add Majesty Maiden, the True Dracocaster to his hand. He flipped up Waterfall of Dragon Souls, discarding Majesty Maiden to draw two cards. He Set two cards in his back row, then played Card of Demise to draw three more! He Set two more back row cards, and moved to the Battle Phase. Ignis Heat attacked and Knightmare Phoenix, but it survived with its effect. Sandoval Set a fifth back row card to finish his turn. Castro drew Prank-Kids Dropsies, and Sandoval flipped up Gozen Match! Castro chose to keep Gumblar on the field, and his Absolute Zero’s effect wiped out Ignis Heat. Gumblar attacked directly. 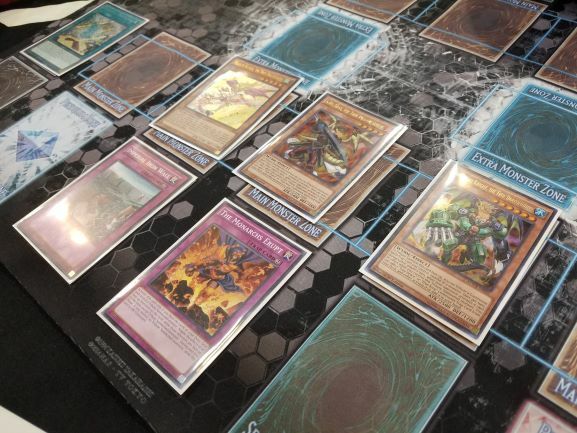 Sandoval used Diagram to destroy his Set True Draco Apocalypse, adding Dinomight Knight, the True Dracofighter, and Apocalypse destroyed Gumblar. He flipped up Heritage to draw a card, then Tributed Heritage to play Dinomight Knight. It attacked directly, leaving Castro with 4400 Life Points. Sandoval had 4500, leading slightly. Sandoval Set another back row card. Castro drew Prank-Kids Fansies. He had one of each Prank-Kid, but nothing to enable them. He Set Fansies. Sandoval used Diagram, destroying a Set Terraforming to get Ignis Heat in his hand. He played The Monarchs Stormforth, and Castro conceded! He knew it was over this turn, but Sandoval had no idea that Castro was using Prank-Kids. That could be an advantage for Castro when it came to the Side Decks for the next Duel. Castro chose to play first this time, and opened with Prank-Kids Fansies, Prank-Kids Dropsies, Prank-Kids Pandemonium, Mask Change, and Destiny HERO – Malicious. He started with Pandemonium, fusing Fansies with Dropsies to play Prank-Kids Rocket Ride! Fansies sent Prank-Kids Lampsies to the Graveyard and Special Summoned Dropsies from the Deck, and the first Dropsies gave him 1000 Life Points and Special Summoned Fansies from the Deck. He then Tributed Rocket Ride to Special Summon Dropsies and Lampsies from the Graveyard. He Tributed Fansies to Set Malicious, then Set Mask Change. Sandoval played The Winged Dragon of Ra – Sphere Mode! He Tributed both Dropsies and the face-down Malicious to hand it over to Castro. He then Set four back row cards and played Card of Demise for three more! He played Dragonic Diagram, which destroyed his Set True Draco Apocalypse to add Ignis Heat to his hand. Apocalypse destroyed Lampsies. He played Heritage to draw a card, then Tributed it to play Ignis Heat. Heritage destroyed the Set Mask Change. Sandoval Set one more card in his back row, and discarded a Dragonic Diagram in the End Phase. Castro had no cards left except Sphere Mode. He drew Elemental HERO Bubbleman – that would have been amazing if Sphere Mode wasn’t in the way. He banished Malicious to Special Summon another copy, and Sandoval flipped Imperial Iron Wall to prevent further uses of the card. Castro Special Summoned Bubbleman, using both his HEROes to play Isolde, Two Tales of the Noble Knights. He activated its effect, and Sandoval flipped The Monarchs Erupt to negate it! Castro used Isolde’s second effect, sending Phoenix Blade, Living Fossil, D.D.R. – Different Dimension Reincarnation, and Axe of Fools to the Graveyard for the cost of the effect. It was still negated, but that got some cards out of Castro’s Deck to hopefully improve his next draw. In the End Phase, The Winged Dragon of Ra – Sphere Mode returned to Sandoval. 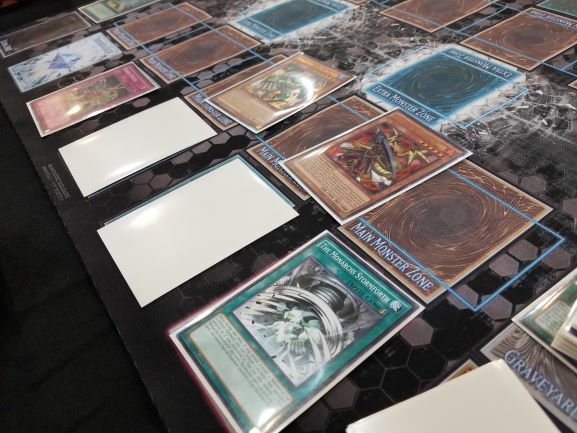 Sandoval used Dragonic Diagram, destroying a Set copy of Card of Demise to add Dinomight Knight, the True Dracofighter to his hand. He Tributed Sphere Mode to play Dinomight, and entered the Battle Phase. Ignis Heat destroyed Isolde, and Dinomight attacked directly. Castro drew Droll & Lock Bird and Set it. Sandoval Set Terraforming and destroyed it with Diagram, adding Majesty Maiden, the True Dracocaster to his hand. He played The Monarchs Stormforth, using Castro’s Droll to Tribute Summon Majesty Maiden, and his True Dracos wiped out Castro’s remaining Life Points! 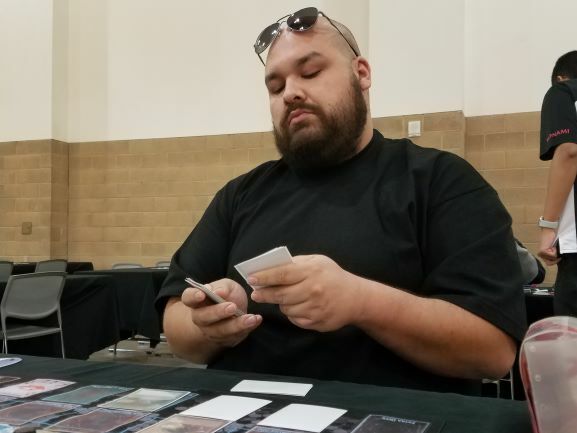 Jaime Sandoval emerges victorious with True Draco!